The steel frame uses tent-like design that enables quick and easy set up. Just pop it open and it is ready to be used. The seat is made out of high quality strong Oxford fabric and powder coated steel frame, sturdy and lightweight. REDCAMP is a professional outdoor equipment brand. We adhering to the "Enjoy our tour, Enjoy our dream." as the design concept, we design and develop the high quality outdoor gears to provide you a favorite outdoor experiences in the nature. Our goal is to provide higher quality products with premium, unique features. All of our gears are thoughtfully designed and tested to exceed your expectation and we love to hear back from our customers about their user experience. Trust us, Trust yourself. 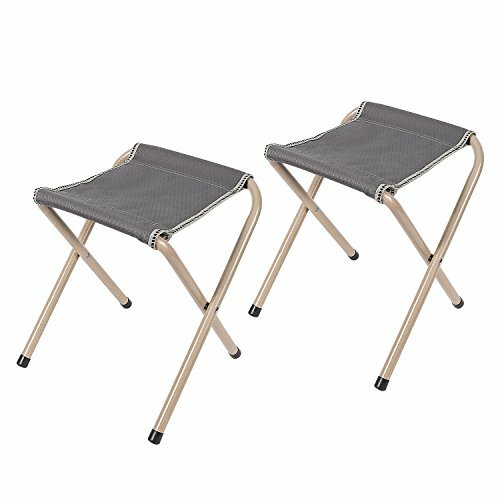 SIZE: The setup size of the camping stools is 9.8×10.6×13.4in, it can support up to 180lbs. MATERIAL: The seat is made out of high quality strong Oxford fabric and powder coated steel frame, sturdy and lightweight. EASY SETUP: The steel frame of this camp stool uses tent-like design that enables quick and easy set up. Just pop it open and it is ready to be used. EASY TO CARRY: This folding stool chair is lightweight and compact. It can be folded to the size that fits your backpack so you can carry it around easily. Package include 2 folding stools. GET THIS CAMPING STOOL RISK FREE: Redcamp offers a 365-day limited manufacturer warranty. If you're not satisfied for any reason, please contact us immediately and we will give you a reply within 24 hours.